Please scroll down for my Lollipop Crafts post, or click here. 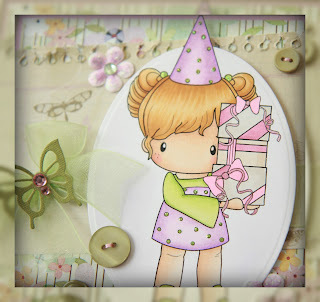 Today at All That Scraps, we are reviewing our January Digistamp releases. Birthday Lucy is one of adorable new Swiss Pixie girls, and she's now available in the ATS store in both rubber or digi! I just loved coloring her up! The ledger paper, from KC&Co., is so soft and pretty. It comes as a spiral bound paper pad, so the "notebook rip" is already there! No need for another punch! Used a CC Design Cutters Butterflies Die.. butterfly is the smaller one with some pink gems added. I didn't have small flowers to match the purple on the dress, so took some white flowers and colored them with copic markers. The gorgeous green ribbon is from my good blog-friend, Amy, and thanks to Amy, I found a new way to tie it... you can check it out here on one of her many awesome videos. She's super amazing!! Be sure to stop by the ATS blog to see more spectacular reviews from my team-mates! All digistamps are now available at the All That Scrap store!! 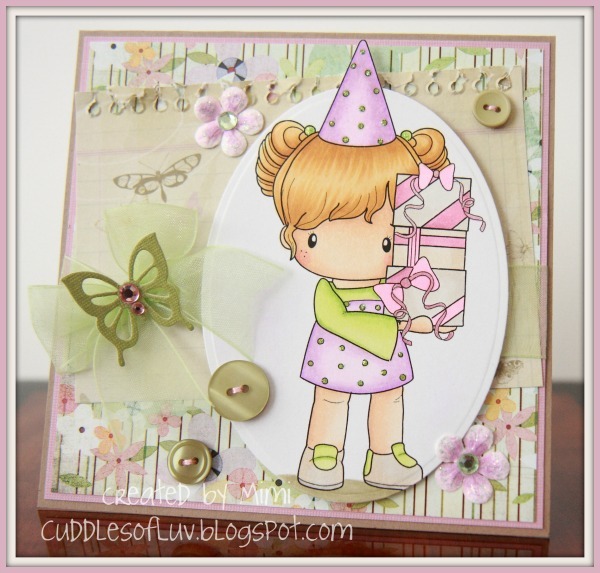 Lovey image, fabulus card.. Great colouring. Great Job! This is gorgeous Mimi, love your paper mix and the spring time colors! Lucy looks amazing, totally awesome card! Glad you could use the ribbon trick! Super sweet card hon. Just love all the pretty colors and accents. Wonderful job! your card is so beautiful Mimi, love the sweet image! Wow Mimi, cute card. Just love the sweet image and embellies. Aww she is too cute! Love the colors u chose and the details!